This weeks kick is Jicama! I can’t enough of this root, yam bean, Mexican water chestnut, Mexican turnip, sengkwang, yacon or whatever else it’s referred to. All I know is, is that this stuff is the “bomb.com,” (that’s my inner crazy speaking)! Some quick facts before you head to the grocery store. 120 grams about 4oz or 1cup of this is only 46 calories, 11g carbohydrates, 6g fiber, 2g sugar, 1g protein and no fat. It also contains healthy amounts of minerals like magnesium, copper, iron and manganese and small amounts of B-complex vitamins such as folates, riboflavin, pyridoxine, pantothenic acid and thiamin. If you’ve never had Jicama, it taste almost like an unripe pear. It’s mildly sweet with a nice crisp texture. My personal favorite way to eat it is in its raw form sliced up like fries and dipped in hummus. 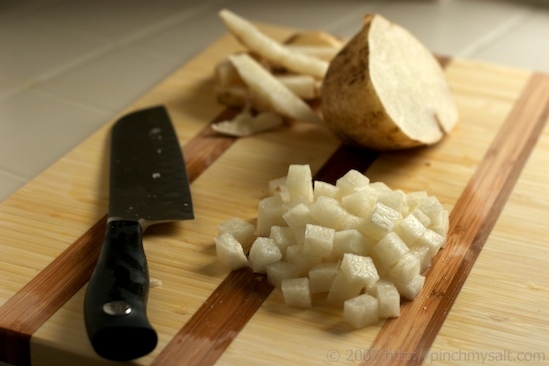 You can also cook Jicama to add a nice crunch to any dish! I’ve included some recipes you can try. This is a great way to get in some fiber without the calories. I am obsessed with jicama. If only it wasn’t so hard to cut! I like it plain, or with just a little lime and chile powder. It is great with oranges too!